Levitra is one of the top medications for ED, up there in the ranks of Cialis and Viagra. The good news is that Pharmaris Canada, one of the leaders in innovative prescriptions and over-the-counter products in the Americas, recently announced that in addition to the generic version of Viagra they already have on sale, they will also begin to offer generic Levitra and generic Cialis to consumers as well. The generic Levitra on offer from Pharmaris Canada will come in 20 mg tablets with varying amounts of pills per pack. Of course, buying more pills at a time offers the best value. The generic Levitra comes from Sava Healthcare and Ajanta Pharma in India; it goes by the name Savitra or Valif depending on the manufacturer. Generic Levitra Enters the Market: Why Now? Why hasn’t there always been a generic Levitra option on the market? Why is this development happening now? There’s a quick and simple explanation to this question. The reason is that the patent on Levitra medication is expiring this year. When drug patents expire, other pharmaceutical companies are able to come in and create generic equivalents of these medications. According to the U.S. Food and Drug Administration, the patent on 5 mg vardenafil hydrochloride tablets—better known as Levitra—is set to expire on October 31, 2018. From then on, other drug manufacturers will be able to recreate a biologically identical drug to Levitra and sell it for much cheaper than the brand name drug. Currently, generic versions of Levitra are available from India. It’s big news when the patent expires on a prescription drug because each medication can have a whole host of patents on them. For example, one simple drug can have up to a dozen or even more patents on it. These patents may cover everything from the delivery mechanism to the active ingredients. In addition, if the intellectual property patents for different parts of the drug are submitted at different times, then the various patents for each item may expire months or even years or decades apart. What happens when a drug patent is up? Usually, a variety of generic drugs enter the market. In fact, up to 15 or more generic may come into play when a drug patent expires. When this eventually happens, it may not be good news for the pharmaceutical company, but it’s great news for patients and consumers! Thus, it’s not every day that a major brand name drug becomes available in generic form due to the expiration of its patent. But when it does happen, patients around the world who rely on the drug rejoice. Their go-to prescription is now available in an equally effective but much less expensive form, making it easier on their lives and wallets. Using a medication like Vardenafil has a relatively short and quick onset. It also requires less stimulation to achieve an erection than other ED drugs do. Best of all, Vardenafil has less likelihood to cause visual disturbances than other ED drugs. One common misconception is that drugs like Levitra are able to stimulate or encourage sexual desire. This is not true. These drugs will not help to stimulate sexual interest, but they can help men with their sexual performance and stamina. It’s also important to note that Levitra cannot protect against sexually transmitted diseases (STDs). STDs like HIV, Hepatitis B, gonorrhea, and syphilis will not be prevented through the use of Vardenafil. Using another form of protection to help prevent disease is important in any sexual encounter. Are there any risks to using Vardenafil? There are some potential side effects to be aware of when taking generic Levitra. Some common side effects include blurred vision, dizziness, flushing, headache, a sensitivity to light, and a stuffy or runny nose. Patients who experience these symptoms may want to talk to their doctor about considering alternative options for medication. However, patients may face other, more serious side effects as well. It is important to contact a doctor if any of the following symptoms present themselves while taking generic Levitra: an erection that lasts longer than 4 hours; chest, jaw, or left arm pain; fainting; irregular heartbeat; nausea; severe dizziness; or vision loss. In addition, it’s important to note that Vardenafil may interact with other medications, including itraconazole, clarithromycin, ritonavir, hepatitis C virus, rifampin, and more. That’s why it’s vital to speak with your doctor or prescribing physician about any and all medications you take before starting a new course of treatment. Sure, there are side effects that come with every ailment out there. But on a positive note, taking Vardenafil can have some unexpected side effects that come as a pleasant surprise. These lesser known facts are not necessarily the reason that people turn to these drugs, but it’s important to note that these things could be part of your experience as well. The medications address the physical side of ED, but in doing so, they may also be helping to address the psychological aspect of illnesses like ED. Effectively treating ED issues can have a major impact on the mental health and wellness of a patient. Feeling in control and sexually fulfilled again can dramatically change a man’s outlook on life. Experiencing psychological healing as a result of taking Vardenafil is not a guarantee, but it can certainly provide a movement in the right direction. What will the emergence of generic Levitra look like for the ED market? As with the release of any generic medication, it’s likely that more patients will have easier access to the prescriptions they need. There’s no doubt that Vardenafil will impact the ED market in major ways, but only time will tell exactly what this will look like. A report entitled Erectile Dysfunction Drugs Market - Global Industry Analysis, Size, Share, Growth, Trends and Forecast, 2013 - 2019 makes the following predictions about the global ED market as it relates to the emergence of more generic drug options. -	“The global erectile dysfunction drugs market will decline in the coming few years due to the growing threat of counterfeit drugs. - Expiration of patents of many blockbuster drugs will further impede the growth of the global ED drugs market. -	The global erectile dysfunction drugs market will also be suppressed by the narrowing of insurance coverage for erectile dysfunction treatment. -	The rising prevalence of sexually transmitted diseases among ED drug users will further challenge the market. Whether or not they come to pass, these predictions further demonstrate why the release of Verdenafil is so essential to the health and wellness of patients. With insurance coverage narrowing, finding an affordable option that works for ED is more important than ever. The need for ED drugs will continue to expand, and yet in some ways, they will be harder to access due to the lack of insurance coverage. However, counterfeit drugs are not the answer. Generic drugs are. Counterfeit prescription medications are dangerous and do not have a place in the market. Generic drugs, on the other hand, are scientifically tested. They are safe and approved for administration. Generics are an affordable way to get the ED drugs a patient needs without turning to dangerous options like counterfeit drugs and without overspending on prescriptions. Clearly, the report indicates that the release of drugs like generic Levitra onto the scene will bring about sweeping change for patients. It’s good news for patients and consumers that as insurance coverage shrinks, affordable options for purchasing ED drugs expand. In short, this means that patients should not have to go without the prescription medications they need just because the name brand options are out of reach financially or no longer covered by their insurance. On the contrary, as the need for ED drugs continues to expand, patients will have a safe and desirable alternative to shopping for dangerous counterfeits. They will have access to generics that they need at a price they can afford. Wondering where to purchase generic Levitra for yourself? Vardenafil sold by Pharmaris Canada is a great option. This will be the newest and first version of generic Levitra from Canada. Best of all, it will be priced cheaper yet still maintain equivalent (or even better) quality. Buying your prescription medications from a trusted pharmacy like Canada Pharmacy Online is a smart move. Not only do you feel a peace of mind from making wise purchasing decisions, you also don’t break the bank in the process! Shop our site to find exclusive discounts on purchases of generic Levitra. We supply various quantities and even offer Levitra coupons and discounted prices on our blog. Always make sure to do extensive research and make sure you’re ordering from a pharmacy you trust. When shopping an online Canadian pharmacy’s website, you’ll want to ensure that the pharmacy is accredited. This will help assure you that the pharmacy only sells quality medications from trusted sources. In addition, the pharmacy you patronize should be a CIPA member and a Certified Canadian International Pharmacy. Seeing Pharmacy Checker approval is another plus. 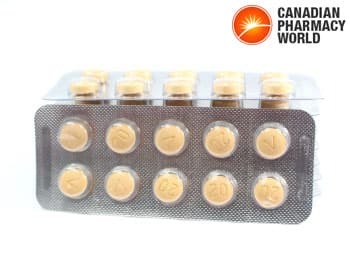 Canadian Pharmacy World is an approved Canadian pharmacy, and we’ve been providing our customers with quality products and excellent prices since 2006. To learn more, we invite you to visit our About Us page. We offer free shipping to the United States, helping to keep your prescription costs as low as possible. Skye Sherman is a freelance travel writer based in West Palm Beach, FL. Her work has appeared in Lonely Planet, AOPA Pilot, Palm Beach Illustrated, Skyscanner, and more.